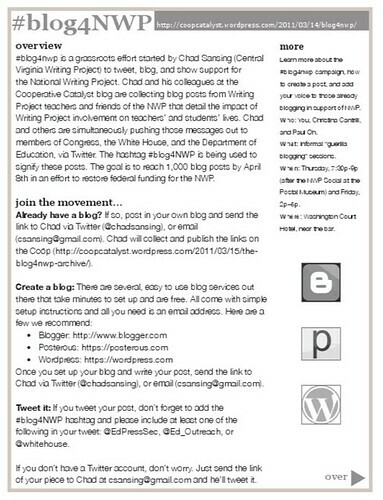 A few smart National Writing Project folks created this handy flier for folks to add their voices to the effort around Blog4NWP (we’re aiming for 1000 blog posts). 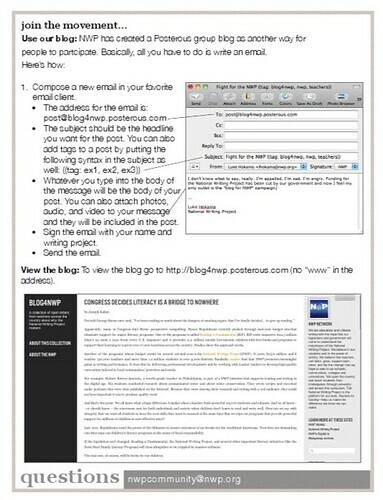 it shows how to post and how to use a Posterous blog set up for the effort — just email your thoughts and it gets posted for you. Get the flier directly here. Pass the flier on to friends and colleagues. And please, post your support. And so, I end the March Book Madness feature, where I have been trying to highlight both books that my students have been reading and the projects they created in an independent book unit. (and I tossed in a few of my own reviews here and there). Most of my students used Glogster; some went a more traditional poster route. All worked hard to show their understanding of the books and to create a visual recommendation of the book they had read. Here are all of the Glogster Projects again. I hope you enjoyed it all. Now, go read. First up, we took our students on a field trip yesterday to an indoor soccer arena, where we had an entire (and exhausting) day of sports activities. There was soccer. There was dodgeball. And there was our game of Quidditch. We (Atomic Blur) played against two other sixth grade class teams in scrimmage, without keeping score. We’ll play our third team in scrimmage in two weeks, just days before the 2011 Quidditch Tournament at our school (where all four sixth grade classes compete for the Quidditch Cup). Next week, we’ll be doing artwork and coming up with plays. I know I have written this before but: I truly do have one of the nicest classes I have had in years. I see it in the classroom, of course. I see it in the hallways. But on the Quidditch field — where they get very passionate and we have to temper some competitive spirit when it gets too intense — they were marvelous to coach and wonderful to watch. They were supportive of each other. They were cheering each other on. High fives, everywhere. The game seemed to bring out the best in just about everyone. I know some of you may be wondering: what is this game of Quidditch you play? Here’s a video we made two years ago (for our tenth anniversary of the game) to show others how to play it. Second, my middle son had his first little league baseball practice yesterday. Once again, I am one of the assistant coaches. Really, I am just “helper man.” We had our “draft” the other night, which I usually write about but didn’t this year, and we got a good crop of kids, it seems. The strange twist this year was that there were not enough little league kids to field all the teams (more are playing lacrosse than every before) so our team got folded into another team. My son was fine with that shift (except for losing his team name and the color shirt, which used to be yellow and now will be green), since now he is on a team with two of his best friends, and we have more older kids who have played this level than any other team. I think we may be the favorites this season, which would be nice, since it has been a few years of awful, terrible records (but still fun). We have more talent this year than ever. My arm is a bit sore from throwing the ball for the first time since last summer, but it was fun to see the kids tossing the ball, hitting on the diamond, and catching fly balls. That sound of the ball smacking the glove, and the laughter of young players back on the field, is spring to me. Here is another in my March Book Madness Projects for this month, as another student read and devoured the Maximum Ride series. Her glogster poster is full of thoughts and praise about the story (which I read and found to be just ok). My new band is really coming together. We’re still working on a name (but have it narrowed down to some finalists) and we need some gigs down the road (our first outing may be a benefit concert at my school), but the rock and roll groove is there. We’re working on songs from Creedence, to Motown Soul, to The Outsiders, to some original stuff. Mostly, I am the saxophonist, and one of the songwriters as we slowly mesh some original material into the mix. Last night, our lead singer was absent and I had to step in and do the vocals, so we could at least practice through some songs (including a medley of Johnny B Goode, I Saw Her Standing There, Summertime Blues, and Runaway — way out of my range for most of those). Man, I’ve sort of lost my voice this morning and taking on that role of lead singer was more difficult than I remember it. It also brought me some renewed appreciation for our singer, who has a wonderful voice and a wide range. It was fun, but strenuous, and I am going to need my voice today. If you see it, can you remind it to come back home. Thanks. In some years, Judy Blume has been all the rage. Not so much this year, but I still see some of her books floating around with my students. This Glogster project is for Double Fudge. This is part of my March Book Madness, which is going to be wrapping up soon. I hope the book reviews and projects have been helpful. I’m pretty excited about today and tomorrow because my sixth graders are going to be using their narrative paragraph writing (they wrote about a concrete memory object that represents a strong memory) as the script for creating a digital story on iMovie. They are excited because they haven’t used the Mac cart much this year (the PC cart is in our room and the Mac cart is in high demand for the younger grades). On Friday, I walked them through a bit on how to use iMovie. A show of hands indicated that only about 12 of my 80 students have ever used iMovie, so it will be a real experience for them. We have used PhotoStory3, the PC version of digital storytelling, so they have some understanding of the meshing of image, and narration, and music. But iMovie is another level. It’s more sophisticated, but still, pretty easy to use. Lucky for me, I immersed myself in iMovie recently for a Digital Storytelling Workshop that I led. (see website resource). What I worry about is whether they will remember to bring in their photos, or their flash drives, or the object itself (we will use Photobooth to take pictures, if we need to). They need to have their resources in order to begin the project and we only have the cart for a few days. We’ll see …. is limited in scope and therefore, is doable in short amount of time. 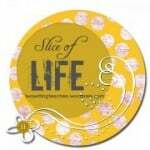 You can see my sample at the top of this post (about the tea cup). And this video collection is from a few years ago and they were done with Photostory. Pay attention to the voices. You don’t get that emotional connection with words on the page. That’s the power of digital storytelling.